This paper shows that mechanical ultrafine grinding of poplar wood is an efficient pretreatment approach to enhance its reactivity during liquefaction. The microstructural features and chemical properties of biomass samples with different particle morphology were studied. 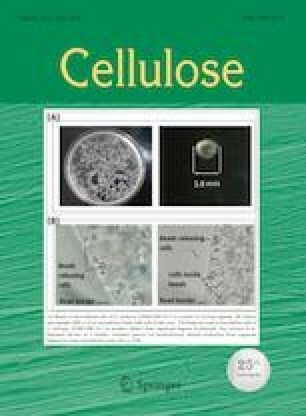 In particular, we found that more cellulose and hemicellulose were exposed on the outer surface of the ultrafine powder (cellular scale of plant) and the crystal lattice structure of cellulose was significantly damaged. As a result, the degree of liquefaction reached 92.03% at 180 °C using UP feedstock, largely exceeding the value (53.35%) obtained at the same temperature using PS0.25. Two groups of value-added chemicals, namely phenolics and methyl glycosides were obtained during liquefaction. At 180 °C, the yields of methyl glycosides and phenolics obtained from an UP feedstock were, respectively, 28.45% and 10.17% higher than those obtained from the PS0.25. In addition, a high degree of liquefaction (> 90%) could be obtained at a temperature 40 °C lower than the one required by PS0.25, greatly reducing the occurrence of side reactions and improving the purity of target products. 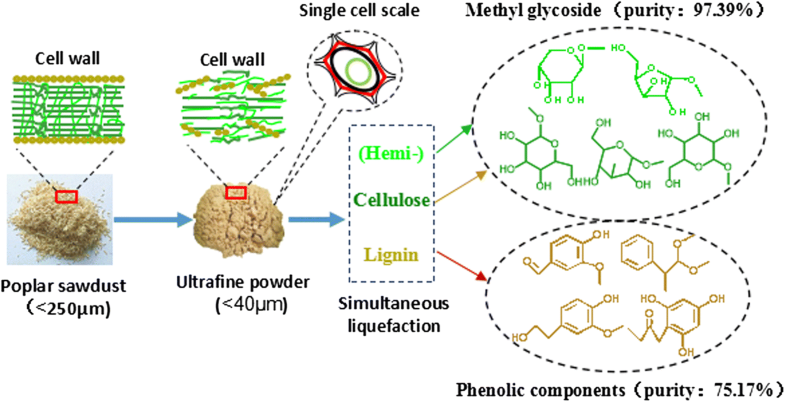 Overall, the mechanical fragmentation of biomass at cellular scale is a promising pretreatment method allowing high valorization of the entire biomass. The online version of this article ( https://doi.org/10.1007/s10570-019-02332-0) contains supplementary material, which is available to authorized users. The authors would like to thank the financial support provided by the National Natural Science Foundation of China (31530010) for this investigation.